I have enjoyed this is a series since the first book, although I missed the third one somehow, and I am enjoying the development and evolution of the characters and the village. This story is a bit of a locked room mystery, as the victim was found hanging in a cooler that was locked from the inside. Most agree that it is a suicide, but Siobhan knows something is not right and is sure it is a murder. As she investigates, she finds clues to implicate more and more suspects. Is it the pregnant wife? The disgruntled poker players? A jewel thief? Someone that the wife is having an affair with? Or maybe it was suicide? Read along as Siobhan puts the clues together to solve the mystery. Siobhan is the main character and she is a sympathetic, likable character that has continued to grow and come into her own. I love visiting with her family although in this book it was a secondary role. She is the oldest and has been responsible for her siblings since her parents were killed. It is an important role in her life and it makes her even more likeable. She is now a member of the garda, so is technically not an amateur sleuth any longer. She is very thoughtful, meticulous and is able to untangle clues and put them together when it comes to solving a crime. The relationship between her and Macdara has continued to evolve as well, and it played a rather surprising and humorous role in this story. He is very respectful of her skills as a garda and even before. He listens to her as she solves the puzzles and between the two of them, they are able to untangle any mystery so far. The mystery was well done and woven throughout the story. It was a locked room type mystery with plenty of clues, twist, turns and red herrings thrown in. While the reveal was not a total surprise (I had some things figured out), some explanations were, and I always like a story when I don’t know all the answers until they are revealed. A well written and enjoyable mystery that I recommend to anyone who enjoys a good, clean, mystery. The publisher generously provided me with a copy of this book upon request. The rating, ideas and opinions shared are my own. 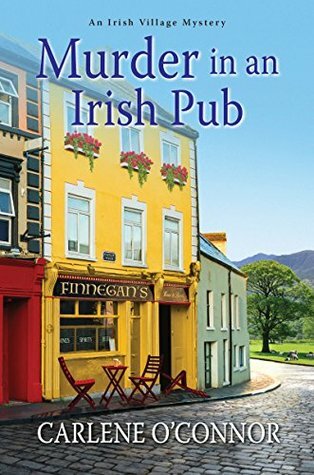 About the Book: When competing card sharps stir up Siobhán O’Sullivan’s quiet Irish village, a poker tournament turns into a game of Hangman . . .
About the Author: Carlene O’Connor comes from a long line of Irish storytellers. Her great-grandmother emigrated from Ireland to America filled with tales and the stories have been flowing ever since. Of all the places across the pond she’s wandered, she fell most in love with a walled town in County Limerick and was inspired to create the town of Kilbane, County Cork. Carlene currently divides her time between New York and the Emerald Isle. Lovely review, from the mystery to the Cork town and characters I think I’d have fun with these. Thanks Kimberly. They are all available as audiobooks on hoopla from my library, so you might be able to find them. Perfect book for the “season.” Wonderful review, Carla! Thanks Marialyce. Yes, reading Irish authors in March is a fun thing to do. I love your review. I had this one, maybe I still do, but I felt as though I was a bit behind and needed to catch up with the first few in the series. I have ordered them so I can read them and then keep going…..
Love these kinds of mysteries! Nice review. I’ll look for these books. Thanks! Thanks Peggy. I hope you enjoy them as much as I have.